American Heart Association, Cardiac Arrest Resuscitation Training and EKG/12 Lead Courses. See all courses offered by EME below including 12 Lead, CPR Command System, and AHA Certifications. 12 Lead EKG and rhythm recognition are among the many cornerstones to your care when treating patients. Do you feel like you would like to review and test your knowledge as well as learn some of the advanced interpertation techniques? 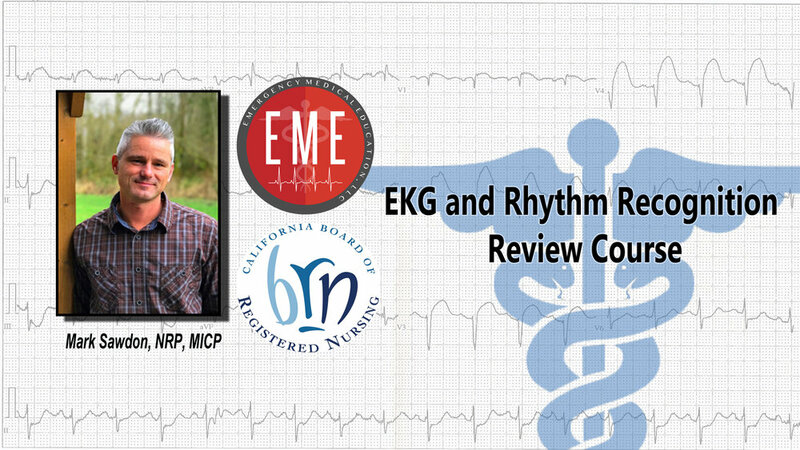 During this course we will cover the EKG fundamentals and beyond, quick interpertation of rhythms and injury patterns that require your immediate attention, interventions associated with specific rhythms and tools to build your foundation to 12-lead interpertation and injury pattern recognition. This will be a straight forward, case based presentation that is sure to give you tools to bring back to the bedside! I look forward to seeing you in class! Sign up today, space is limited. *Recommended that you take this course BEFORE attending "Advanced 12 Interpertation, A Case Based Approach". Advanced 12 Lead Interpretation "A Case Based Approach"
12 lead interpertation has quickly become the standard of care for both pre-hospital and in-hospital providers. Do you feel like you have a pretty solid foundation to your 12 lead assessment? Do you feel like you can identify many of the injury patterns with your systematic approach? If the answer is yes, I would like to invite you to join me for an informative, cased based, interactive presentation specifically crafted for the experienced provider. The ideal course attendee will have a soild sytematic approach to reading a 12 Lead, possess the basic knoweldge of medications delivered during cardiac events and a strong understanding of basic rhythms and the anatomy of the heart and coronary vessels. This will be a fast paced presentation chalked full of actual 12 leads from real patient encounters! I can not wait to see you, sign up today space is limited! This unique course will help you and your team practice the event of a cardiac arrest resuscitation in your environment. A Cardiac Arrest Specialist will be dispatched to your location to deliver hands on resuscitation training to you and your group. During this 3 hour session we will present you cardiac arrest scenarios utilizing a state of the art mannequin to help make the scenarios as life like as possible. During this training we will work on team response and dynamics, closed loop communication, high-performance CPR and compressions, early defibrillation, medication administration, bag valve mask ventilation, intubation through compressions and introduce you to the CPR Command System TM. If you are looking to practice for a cardiac arrest in your environment we are the group for you! This course is tailored for your environment, we provide training in hospitals, surgery centers, clinics and with fire departments across the pacific northwest. Contact us today to schedule a time for us to bring this training course to you! The Basic Life Support Provider course teaches both single-rescuer and team basic life support skills for application in both pre-hospital and in-facility environments, with a focus on High-Quality CPR and team dynamics. Course cost is per person and does NOT include certification "e"card or required student manual. This certification can be added on (additional $50) to ACLS or PALS re-certification for discounted rate with group pricing. If you have completed the online "HeartCode BLS Provider Course" contact us for a skills check off and certification "e"card! Advanced Cardiac Life Support Renewal (ACLS-R) class consists of approximately 8.5 hours of classroom updates, simulated cases and a written test consisting of multiple-choice questions. Short breaks are included. This meets or exceeds the minimum standard for AHA Renewal course. Course cost is per person and does NOT include certification "e"card or required student manual, certification is good for 2 years from date of course. A BLS Provider "add-on"(additional $50) will give you a BLS Provider card in addition to your primary ACLS or PALS card. It does require that you complete the BLS part 1 online portion. The BLS check-off will be included on the same day you take the primary ACLS or PALS Renewal or Initial Certification course. You must bring your online BLS Provider completion certificate to class in order to be checked off on the BLS skills. This is an easy way to get both cards at the same time! Pediatric Advanced Cardiac Life Support (PALS) initial certification class consists of 9 hours of classroom lecture, simulated cases and a written tests consisting of multiple-choice questions. Short breaks are included. This meets or exceeds the minimum standard for AHA New Provider course. Course cost is per person and does NOT include certification "e"card or required student manual, certification is good for 2 years form date of course. A BLS Provider "add-on"(additional $50) will give you a BLS Provider card in addition to your primary ACLS or PALS card. It does require that you complete the BLS part 1 online portion. The BLS check-off will be included on the same day you take the primary ACLS or PALS Renewal or Initial Certification course. You must bring your online BLS Provider completion certificate to class in order to be checked off on the BLS skills. This is an easy way to get both cards at the same time! The Pediatric Advanced Cardiac Life Support Renewal (PALS-R) class is approx 6-8 hours and consists of classroom updates, simulated cases and a written test consisting of multiple-choice questions. Short breaks are included. This meets or exceeds the minimum standard for AHA Renewal course. Course cost is per person and does NOT include certification "e"card or required student manual, certification is good for 2 years form date of course. A BLS Provider "add-on"(additional $50) will give you a BLS Provider card in addition to your primary ACLS or PALS card. It does require that you complete the BLS part 1 online portion. The BLS check-off will be included on the same day you take the primary ACLS or PALS Renewal or Initial Certification course. You must bring your online BLS Provider completion certificate to class in order to be checked off on the BLS skills. This is an easy way to get both cards at the same time! Once you have completed the AHA online BLS-Heartcode Part 1, you will have 90 days to schedule your Skills check off. Please visit cpr.heart.org to complete you online course. After you have your completed certificate in hand, contact us to schedule your skills check off! Cost does not include paper or e-card cards cost of $6. Once you have completed the AHA online ACLS-Heartcode Part 1, you will have 90 days to schedule your Skills check off. Please visit cpr.heart.org to complete you online course. After you have your completed certificate in hand, contact us to schedule your skills check off! Cost does not include paper or e-card cards cost of $15. Once you have completed the AHA online PALS-Heartcode Part 1, you will have 90 days to schedule your Skills checkoff. Please visit cpr.heart.org to complete you online course. After you have your completed certificate in hand, contact us to schedule your skills check off! Cost does not include paper or e-card cards cost of $15.